Explanation: From a delicate orbit around asteroid 433 Eros, the NEAR Shoemaker spacecraft's camera has now imaged the entire surface of the small oddly-shaped world at least once. Recorded on July 7th from a distance of 50 kilometers, this dramatic view is about 1.8 kilometers across. It shows the walls and rims of two large overlapping impact craters on the horizon. Massive boulders which may be debris from the impacts are perched along the crater edges. The prominent boulder on the horizon near picture center is about 40 meters long. 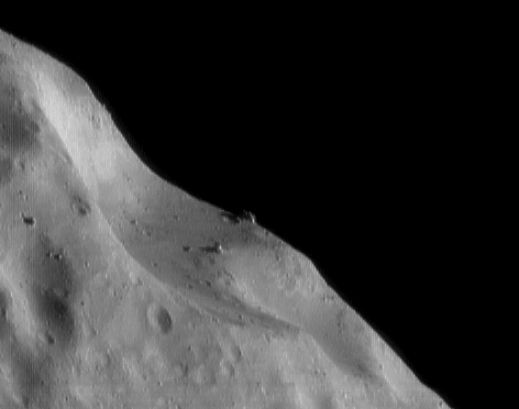 In fact, the NEAR mission to Eros has shown that along with craters and boulders, grooves and ridges are also common on the asteroid's surface. While the craters are clearly of impact origin, puzzles about the other surface features still remain. On July 13, controllers fired the spacecraft thrusters and moved NEAR Shoemaker to an even closer 35 kilometer orbit to enable higher resolution surface studies.